The world's cheapest car has had an upgrade. 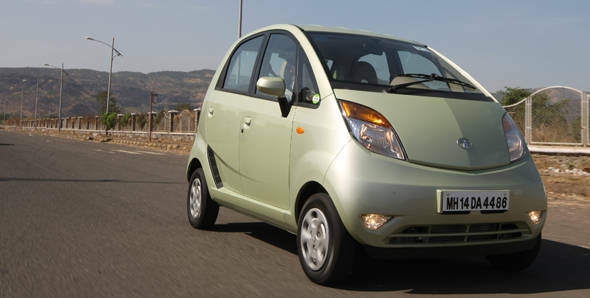 Inflammatory jokes apart, the 2012 Tata Nano is Tata Motors' first refresh of the iconic car since its launch in 2009. It looks identical, but has had some changes made under the hood, or the rear seat, in this case. Tata has bumped up the power to 38PS, up from the original 35PS, putting it on an equal footing with the Maruti 800. Even with the aircon on, it's evidently enough for the featherweight four-wheeler. The car doesn't feel short on power around the city, and I was often surprised to see the speedo needle planted at 100kmph with no preceding drama. The engine has the feel of a heavy flywheel  a bit like an old Yezdi, for those of you old enough to remember. The car tends to lurch a little in the lower gears, but getting away from lights is never a problem. Third gear is nice when you're in the meat of the powerband, and fourth is quite tall, explaining my surprise at the speedo. Tata claims that the 2012 Nano has a best-in-class aircon. Considering that this is a class of one, it's hard to disagree. However, in our testing around Mumbai, I must admit that there were times when I actually turned the aircon down. We drove the LX version, which comes with power windows in front, air conditioning and central locking. All very convenient features, making this little car quite comfortable in daily use. However, quality niggles remain  our test car had a jammed passenger side front door, relegating all passengers to the rear seat. On that front, however, the Nano delivers in spades  the rear accommodations are most satisfactory, particularly for the portly or long in tooth. For the driver, the experience can be best described as cheap and cheerful. While there were no ergonomic issues for this tester, Bert took issue with the intrusive wheel well and close-together pedals. I suspect this will be a common complaint for anyone in the welterweight category or beyond. The genetically gifted will have no problems. The steering is still quite heavy, which was a complaint with the original Nano. In motion, it isn't much of an issue, and rickshaw-style misbehaviour is almost encouraged in a car this size. However, at parking speeds, it can be a pain. The assisted brakes are only just, needing a deliberate stamp to slow down rapidly. NVH is controlled, and Tata claims to have added a "racier" note to the exhaust. At the end of a week's commuting with the 2012 Tata Nano, I have to say that it did not feel like a big step down from my personal Polo. If anything the ride quality was good, with the tiny wheels and generous springs never crashing through Mumbai's usual craters. The revised suspension setup - now with an anti-roll bar in front which improves on the handling, relatively speaking of course. Tata claims to have improved the efficiency of the Nano to 25kmpl, and we got an overall efficiency of 22.11kmpl (20.35kmpl in the city and 27.39kmpl on the highway). Which means you can get away with motorcycle-sized refills in the Nano, all while having nothing strapped to your back and air conditioning to boot.